Home Articles ERP Software Applications: What Can ERP Systems Do for Your Business? ERP Software Applications: What Can ERP Systems Do for Your Business? The Buyers Report in Plastics Business magazine will provide information for a specific product or service that is applicable to the plastics processing industry. Vendors who provide the product or service will be profiled, with information provided in several categories. In this first issue of the magazine, ERP software application providers are profiled. Wikipedia supplies this basic description of ERP software applications: Enterprise Resource Planning systems (ERPs), or Manufacturing Resource Planning systems (MRPs), are software systems that integrate and automate many of the business practices associated with the production and distribution aspects of a company engaged in manufacturing. ERP systems typically handle the manufacturing, logistics, distribution, inventory, shipping, billing, accounting, quality management, and human resource management for a company. In the absence of an ERP system, a manufacturer may find itself with many software applications that do not talk to each other and do not effectively interface. The companies featured in this Buyers Report are those who graciously responded to our inquiries after their software was suggested by MAPP members and other industry representatives. These companies do not represent a comprehensive list of ERP software package providers, but do represent common ERP applications used in the plastics processing industries. CMS Software, Toronto, Canada, is a major supplier of ERP solutions for supply chain-intensive manufacturing and distribution companies, including enterprises with lean IT departments, demanding customers, and stringent requirements for traceability, on-time delivery, and order accuracy. CMS Software was founded in 1986, has over 120 employees, and supports more than 2,500 manufacturing plants in 13 countries. The company has a sizeable customer base in the plastics industry and among automotive suppliers. CMS offers a Total ERP Solution, including MRP II, capacity planning, financial functions, payroll functions, multiple plant functionality, EDI, manufacturing/distribution, and supply chain functions. Through its partnership with Mattec Corporation, the leading supplier of real-time production and process monitoring systems for plastics, CMS is able to provide robust plastics-specific functionality that fully integrates the shop floor with the front office. This includes family-parts integration; integrated mold and die maintenance; integrated EDI with strong bar-coding and traceability; multi-plant/multi-lingual capabilities; seamless compatibility with Mattec plant-wide production; and process monitoring systems, which include real-time OEE, machine down-time analysis, real-time production scheduling/production reporting, SPC, and cavity-pressure control. CMS systems offers a total ERP package. Most customers purchase the software including all functional modules, an unlimited user license, and with all future enhancements included in the basic service agreement. This is in distinct contrast with other suppliers who bill for additional capabilities, more users, and even for upgrades and enhancements. 95 percent of CMS customers find that their needs are covered by the standard software package, with no modifications required before installation. Users get up and operating quickly and realize a return on investment faster. CMS Software is a one-stop, turnkey solution provider, with an in-house staff of implementation, education, training, support, and hardware professionals ready to work directly with customer staff to fully explore CMS Solutions strengths – harnessing functionality to meet customers unique business challenges. This turnkey approach, along with the fully integrated nature of the CMS solutions, translates into a low short-term and long-term cost of ownership. IQMS, a leader in ERP software and the industrys only single-source database solution, provides all the functionality required to efficiently manage and improve business processes. Its flagship product, EnterpriseIQ, is capable of handling all manufacturing and financial needs without requiring expensive third party interfaces. IQMS offers one cohesive ERP package thats easy to use, maintain, and implement. All system modules are developed and fully supported by IQMS. IQMS provides a single source solution with EnterpriseIQ, the only software that is designed by one company, as a single system. The software proves that you do not have to give up powerful features for ease of use. EnterpriseIQ handles all ERP needs, including manufacturing, sales and distribution, financial management, production, inventory, supply chain management, and warehouse management, without requiring expensive third-party interfaces or third-party software. All modules are written, developed, and supported by IQMS and are designed to operate as a cohesive unit in the framework of EnterpriseIQ. IQMS is customer driven, dedicated to its customers and their demanding requirements. Software updates are driven by the customers and the needs of their businesses, today and in the future. As the technology changes and as more demands are placed on manufacturers, IQMS continues to improve its product with enhancements asked for by its customers. IQMS software features an industry-specific design. Each industry, whether it is automotive, medical, plastics, or other, is considered when the software is designed. This means that the terminology is familiar to the users and that industry requirements are met. IQMS is proud of its partnership with its customers and their loyalty to the software that helps them improve business process and business profits year after year. IQMS boasts a 98 percent customer retention rate. Customers receive support through IQMSs award-winning telephone support, always-on internet and email resources, an active users group, and a global network of implementation and training professionals. Customers also enjoy superior performance, reliability, scalability, reduced implementation times, and lower maintenance fees. Made2Manage Systems, Inc. has spent twenty years in the business of delivering ERP software and services that enable small and mid-size manufacturers to achieve continuous business process improvements. In August 2004, Made2Manage Systems acquired DTR Software International, a leading provider of manufacturing, distribution, and financial management software designed for the industry-specific needs of plastics processors. DTR Plastics ERP features a drag-and-drop scheduling control center, allowing users to generate forward finite, queued, and just-in-time scheduling for all workstations and secondary operations. Scheduling provides greater visibility into machine setup and tear down times, preventative maintenance, tooling, and raw material shortages. Within the DTR applications Bill of Manufacture (BOM), users easily can identify build-to-stock jobs with minimum and maximum reorder levels, standard stock colors, and/or custom orders. In addition, users have the ability to capture costs within the BOM and schedule secondary operations, such as label application and silk screen printing services. The inventory management tools manage raw materials, assembled work-in-process items, and finished goods. Users also can view costs for any manufactured part, including detail on materials, labor, workstation, setup, overhead, and tooling, while extruders can leverage plastics-specific inventory management tools to keep track of materials at multiple warehouses and locations and/or manage lot codes and serialized inventory. The systems manufacturing tables make product costing simple. Users can quickly run a variety of different cost scenarios by indicating the quantity breaks and factoring in data on multi-cavity and family molds, the percent of planned time expected to be used, the percent of regrind allowed in the process, and tooling within the tables. Unlike generic enterprise resource planning solutions, DTR Plastics ERP is designed specifically for and sold directly to the plastics industry. It is well-equipped to manage the unique functionality required in both the process and discrete manufacturing operations of more than 300 plastic processors from a variety of niche industries, such as injection molding, blow molding, bag and film processing, extrusion, and thermoforming. Its not about software only. Made2Manage Systems has developed the people, processes, and services to help its customers gain continuous value from their ERP solutions. DTR Plastics Solutions provides dedicated account management, experienced implementation consultants, and customized education plans. Support for users includes a comprehensive customer support web site, expansive support and maintenance services that include unlimited education for all users, and 100 percent customer-focused product development. OpenMFG was created to solve a growing problem afflicting small entrepreneurial manufacturers (SEMs). Smaller, independent companies were falling behind the technology curve, while their larger competitors purchased big-ticket enterprise software packages to interact with suppliers and customers. OpenMFGs founders consulted with the American Society for Production and Inventory Control (APICS) and other manufacturing organizations and interest groups to understand the manufacturing processes and functions that were most important to small, entrepreneurial manufacturers. The company then proceeded to build a modern, affordable software, designed to be as accessible as possible, using open architecture and standards that give growing companies the flexibility they need, along with the ability to work with partners and customers over the Internet. manufacturing to shipping. All of these functions are supported by integrated financial applications to handle accounts receivable, accounts payable, and the general ledger. This level of control means that at any moment, SEMs have the information necessary to redirect resources, answer a customer inquiry, or promise a shipment. The OpenMFG ERP Suite includes inventory management, part definition and costing (including bills of material and bills of operation), master scheduling and MRP, capacity planning, work order management, sales order management, purchase order management, shipping and receiving, and sales analysis. Accounting Modules include accounts payable, accounts receivable, general ledger, and bank reconciliation. OpenMFG also includes a full-featured open source report writer, OpenRPT, as part of the system. OpenMFG does not price by the module. Instead, customers have the option of a flat annual site license or a traditional per-seat perpetual license. OpenMFG sells through certified channel partners and its own direct sales operation, pricing its software according to an affordable annual subscription model. OpenMFG truly addresses the needs of small entrepreneurial manufacturers. OpenMFG provides small companies with technology on par with vendors providing software targeted to much larger manufacturing companies. Since its inception, OpenMFG has focused primarily on bringing sophisticated manufacturing functionality to its customers. 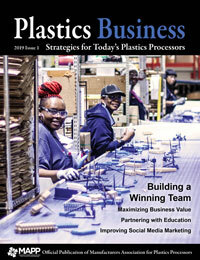 In upcoming issues of Plastics Business magazine, the Buyers Report section will feature clean room services and advances in bar coding technology. If your company would like to be considered for inclusion, please contact Dianna Brodine, Assistant Editor, at dianna@petersonpublicatons.com or (785) 271-5801.